To file expatriate taxes in the United States, you will use the standard deduction or itemized deductions as a way to decrease the amount of your income that is taxable. 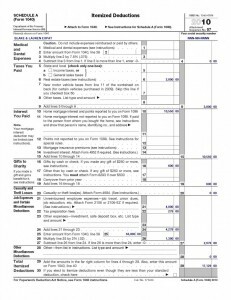 Each year, the IRS adjusts the amount of the standard deduction for each filing status. If you believe that your itemized deductions are greater than the standard deduction amount, you should file Schedule A to claim those deductions. In this article, you will learn about the different categories of itemized deductions you can claim on your United States expat taxes. We will also go through an example so you know how to properly claim these on Schedule A. The following will provide the details and challenges associated with each of the seven categories of itemized deductions. Qualified deductions in this category include payments for doctor’s visits, hospital services, prescription medicine, medical insurance paid with after-tax income, and mileage to and from medical treatment appointments. Over-the-counter medication, gym fees, and cosmetic surgery are not eligible. Please note, you can only use this deduction for the amount of medical expenses that exceed 7.5% of your adjusted gross income. Many people forgo this deduction because of that reason. Qualified deductions in this category include any state or local taxes incurred during the calendar year. Examples are real estate taxes and personal property taxes. If you would like to deduct your state taxes, you can claim the amount actually paid or the general sales tax value that correlates with your state. Late fees or penalties associated with paying these taxes cannot be used as a deduction. Qualified deductions in this category include mortgage interest, mortgage insurance premiums, and mortgage points. You can claim this deduction for both your first and second home, if applicable. These deductions make Schedule A very appealing for homeowners. Please note, this category is also where you can deduct any investment interest for your expat taxes. Deducting gifts given to charity can be a complicated process, but use this information to guide you in completing Schedule A of your expat taxes. For this category, you must give the gift to a “qualified organization,” as deemed by the IRS. This means that the charity was set up and is organized under United States’ law. Most of the time, reputable charities in Canada and Mexico will also qualify. You can deduct any non-cash gifts, but if the gift value exceeds $500, there are stringent reporting requirements. If you wish to donate property worth more than $5,000, it will have to be appraised in order to be a deduction. If you are a victim of casualty, theft, or disaster, you can deduct the amount of your loss on Schedule A. Your house, household items, and automobiles are eligible items. To claim this loss, you will have to complete Form 4684. Consult a tax professional or the IRS website to learn more details. This category is for deductions related to expenses incurred while on the job. In addition, you can claim a deduction for the preparation of your United States expat taxes in this category. Miscellaneous deductions are classified as the income you spent in order to earn more income. For example, investment expenses or safety deposit accounts would qualify. Personal expenses are not deductible. Please note, you can only use this deduction for the amount of career and miscellaneous expenses that exceed 2% of your adjusted gross income. All other itemized deductions fall into this category. Gambling losses is the most common deduction in this section. Other deductions related to losses and expenses are also included. As an example, we will refer to Aaron and Sarah Expat as a couple who moved from Iowa to France. Their adjusted gross income for 2010 was $65,000. Here is a summary of the deductions Aaron and Sarah can claim. The Expats wish to file a joint married return. Their standard deduction would be $11,400. 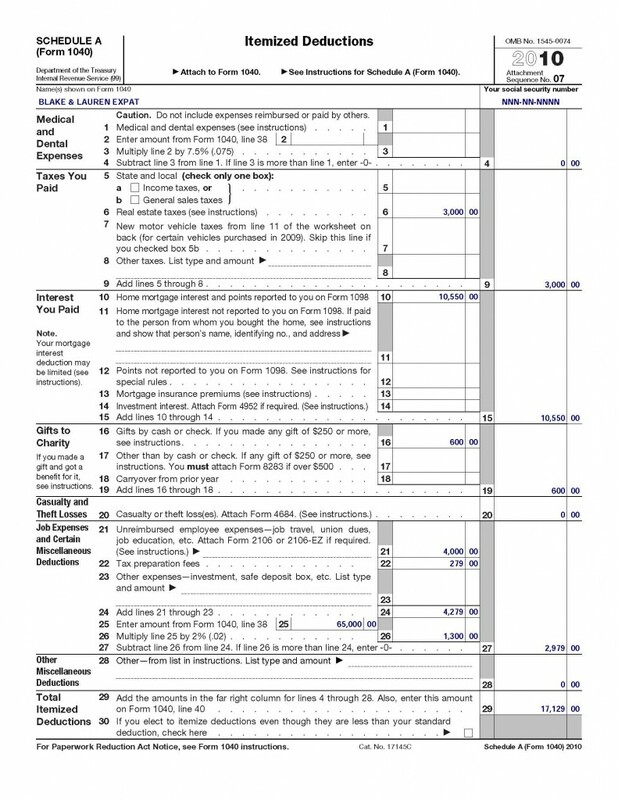 By looking only at the top two items, we can see that the couple’s itemized deduction will exceed the standard deduction. Let’s fill out Schedule A. The expenses incurred while traveling for work should be reported on Form 2106, then attached to your expat taxes. This has been a fairly simple example to show you the basics. Completing Schedule A can be complicated if you claim uncommon deductions. If you need assistance, please contact a tax professional.